The Director of Safety Electronics and Engineering Services in the Nigerian Airspace Management Agency (NAMA), Engr. Farouk Ahmed Umar has been decorated with the fellowship award of the Nigerian Institution of Mechanical Engineers (NIMechE). The award ceremony which took place at the Grand Central Hotel in Kano during the institution’s 31st Annual General Meeting and Conference attracted eminent professionals, politicians and experts from all walks of life. Engr. Farouk as he is fondly called attended Government Science Secondary School, Birnin Kebbi and the Federal University of Technology, Minna where he bagged a Bachelor’s degree in Mechanical Engineering. 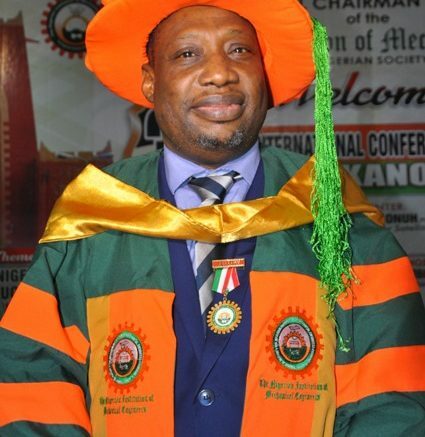 His quest for higher education saw him at the Lagos State University (LASU) where he obtained a Master’s degree in Business Administration in 1999. He later bagged another Master’s degree in International Affairs and Diplomacy in 2009 from Ahmadu Bello University, Zaria. Engr. Farouk joined NAMA in 2002 as a Chief Engineer. Since then, he has held several managerial and strategic positions in the agency such as Airspace Manager, Minna Airport General Manager, Procurement and General Manager, Special Projects, Kano Region. Highly cerebral and a master of his profession, Engr. Farouk has played vital roles in the deployment of some of the critical navigational infrastructure in Nigeria such as the Instrument Landing System (ILS) at Kaduna International Airport, Doppler Very High Frequency Omni-Directional Range (DVOR) at Mallam Aminu Kano International Airport as well as the Stand – Alone High Powered Jotron Radios recently installed in Kano and Lagos Area Control Centres in the country. Speaking after the Fellowship award, Engr. Farouk said the gesture by the institution would spur him to continue to strive for excellence in his quest to contribute meaningfully towards the development of Nigeria. Be the first to comment on "NAMA Director, Farouk Bags NIMechE Fellowship Award"